I read this article and found it very interesting, thought it might be something for you. 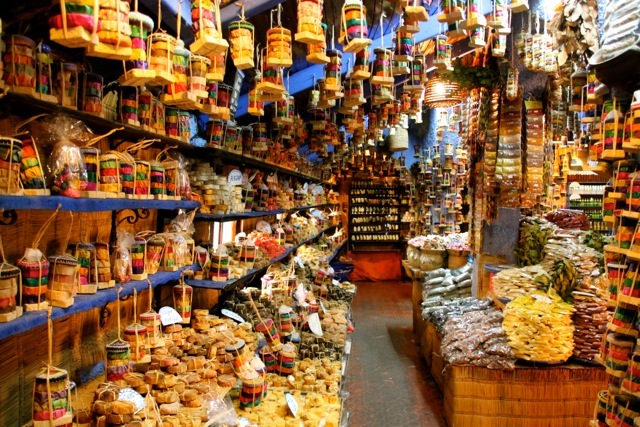 The article is called 7 Places to Shop in Chefchaouen and is located at http://trip-n-travel.com/listicle/21856/. 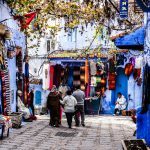 Chefchaouen is a place with its own magic. Thousands of tourists visit it every year to see the blue walls, to feel the specific atmosphere of the medieval town, and, of course, to buy souvenirs. 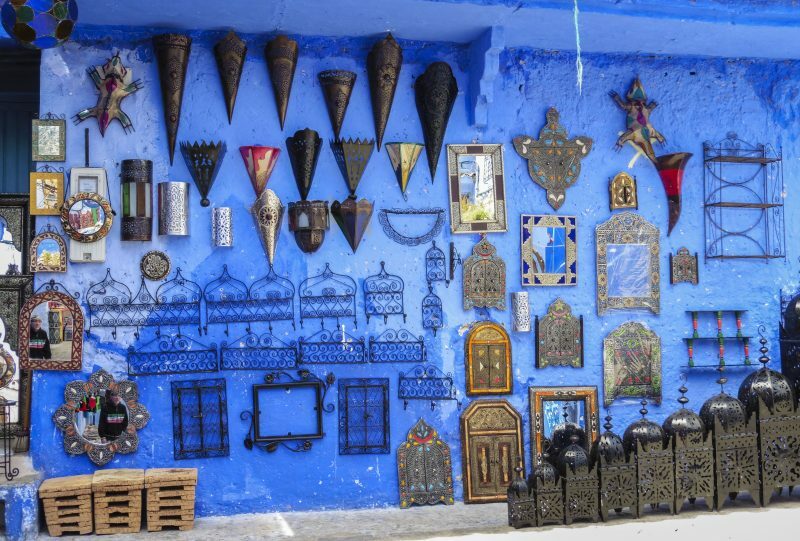 There are plenty interesting places for shopping in Chefchaouen. You should prepare yourself that this will be something unusual – don’t wait for boring boutiques and malls. 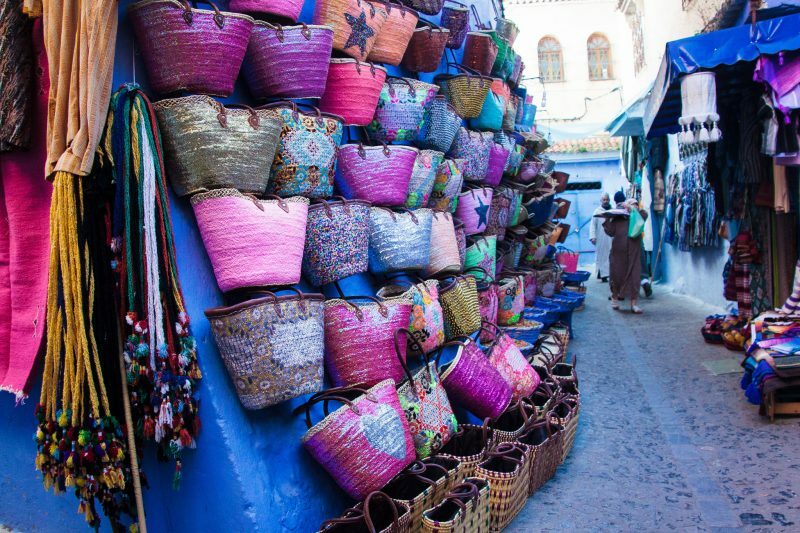 Many tourists come to Chefchaouen to buy souvenirs. If you will be in Chefchaouen, you should visit the Chez Abdul shop. This is a very special place – it is small, old-fashioned and named after a friendly store owner. You can buy all traditional handmade Moroccan souvenirs here: carpets, jellabas, lamps, caftans, Berber jewelry, and Moroccan wool hoodies. Chefchaouen’s Ensemble Artisinal is located in a place called el Makhzen. It is a very interesting place for tourists! You can purchase Riffi blankets and other products at fixed prices here. If you are going to buy jewelry, it is also a perfect place – a host of small shops in el Makhzen sells it. 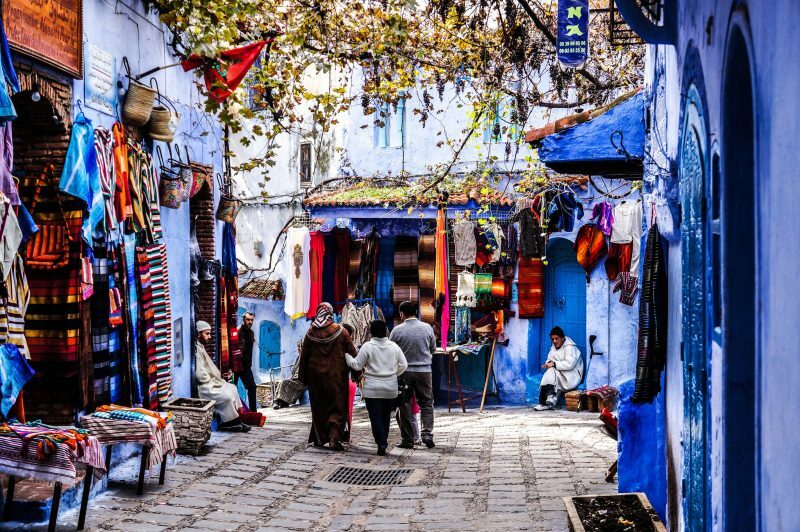 Streets of Medina are a place where many Chefchaouen’s street vendors sell their goods. Blue walls and the smell of spices create a special atmosphere, and no one can resist it. You can by a lot of interesting things here – different trinkets, lanterns, lamps, carpets, kif-smoking pipe, and etcetera. La Botica de la Abuela Aladdin is a great soap shop placed in the old part of the Chefchaouen. You can buy not only different kinds of soaps here but also various oils and natural perfumes and deodorants. This is a perfect place to buy souvenirs for you and your friends. Chefchaouen is not so big place. If you will have time to go through its streets you should spend at list a half an hour on its exotic street shops with wicker products and spices. Don’t forget that in most of these shops prices are not fixed so you can bargain for the best price. Chefchaouen Market is something very old-fashioned and diversified. 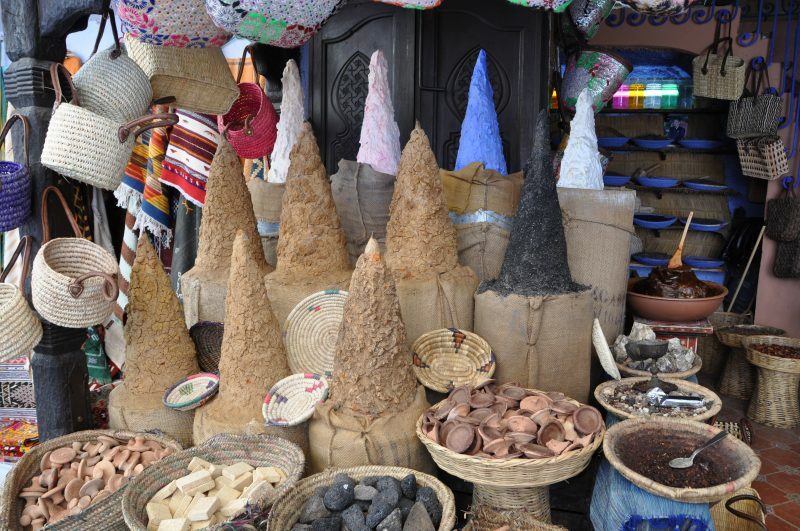 You can find many interesting here – from colorful carpets to crockery, from artisanal clothing to spices and herbs. Don’t be afraid to bargain for the best price here – it is absolutely normal. You can also buy a jewelry here, some of it is very exotic. Colored paint can be used to decorate hands or even face. This can be a perfect exotic present for your friends, so consider buying it. 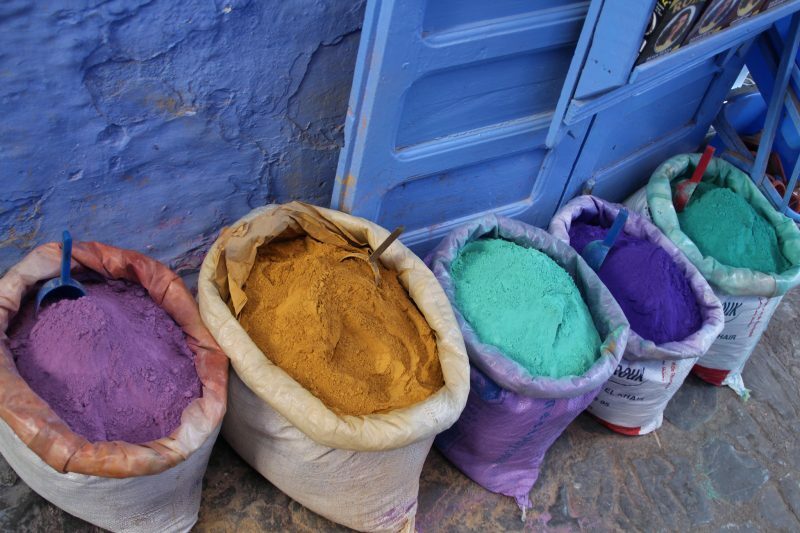 There are few places on Medina streets to buy the colored paint, and usually, paint’s assortment varies a lot in different shops. So try to go through all of them – Medina is not so big. As you can see, there are many interesting places in Chefchaouen. This town is not so big; however, you can spend a lot of time here visiting all its shops and looking for souvenirs to your friends. Be friendly and you will see how prices become even more affordable – people here know how to make discounts. Have a good trip and travel!